I grew up in Texas where chili is part of the holy trinity of cuisine. As a Texan, you have your barbecue, your guacamole, and your chili. What these three dishes have in common is umami, that feeling of fullness in the mouth that comes from experiencing a combination of fat and spices. A layer of fat coats the inside of your mouth, and the spices are suspended in that layer, triggering the taste buds in an explosion of sensation. Many chain restaurants add MSG to their dishes as a way to create umami, but this strategy is a cheap and easy trick and should be avoided by those of us interested in healthy eating. I used to make an awesome chili out of pork tenderloin and black beans. My family loved it. But when I became a vegan seven years ago, I gave up making chili because it wasn’t the same without meat. A few months ago, my wife threw down the gauntlet, challenging me to make a vegan chili that tastes as good as my pork tenderloin version. I accepted her challenge. After a number of attempts that were edible, but not outstanding, I heard a chef on television talking about how roasted tomatoes create a “umami bomb in the mouth.” I had been using organic canned tomatoes as the base of my chili, so I decided to try roasting fresh tomatoes instead. My previous attempts had shown that both mustard greens and vegan chorizo add deep layers of flavor as well as meaty textures, so I decided to combine them with the roasted tomatoes. The result was nothing less than phenomenal – the umami bomb that I had previously experienced only with fatty spiced meat. My family loves this dish. And if you want deep flavors and rich satisfying nutrition, you’ll love it too. 1.Sauté coriander seeds without oil. Then sauté onions, garlic, carrots, bell pepper, jalapeño, and celery separately in small amounts of oil and put the sautéed ingredients in a large pot with tomatoes, broth, chili powder and salt . Bring to boil. Reduce heat and let simmer for 1 hour, stirring frequently. 2.Add mustard greens, chorizo, oregano, basil, honey, wakami, and vinegar. Bring to boil. Reduce heat and let simmer for 1 hour, stirring frequently. 3.Add beans and remaining spices. Bring to boil. Reduce heat and let simmer for ½ hour, stirring frequently. 4.Serve with hearty bread, a dollop of vegan sour cream and a garnish of cilantro. 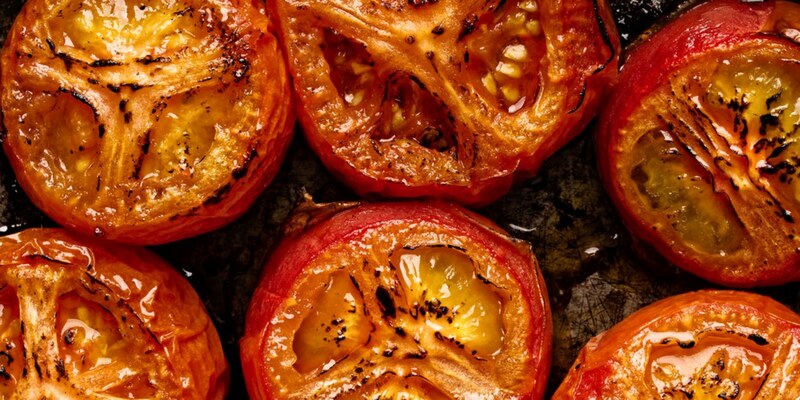 Roasted tomatoes lend their full flavor to this dish. This entry was posted on March 11, 2017 by Vox Populi in Health and Nutrition, Note from the Editor and tagged Michael Simms, Roasted Tomato Mustard Greens and Chorizo Chili, The Vegan Kitchen, Vegan chili, vegan cooking.